Cancer is a disease that has impacted too many of us at Channel Impact — and too many of our colleagues in the IT channel. That’s why one of the pillars of our organization is to give back in support of the fight against cancer as well as other causes. Recently, while talking to our amazing Partner Marketing Manager Alyson Walter, I learned that she overcame adversity at a young age. Like other Channel Impact executives, Alyson has used her experience to help others. We’re so proud to have her on our team and proud to share her story on the blog. Since working with Alyson, I’ve learned that more than 700,000 Americans are living with a brain tumor, according to the American Brain Tumor Association. Alyson was one of those Americans. Alyson’s world turned upside down in 2008 when she was admitted to the hospital after a car accident and a period of prolonged headaches. After tests revealed a brain tumor, she was relieved to learn that the tumor was not cancerous. Still, it needed to be removed as soon as possible. A few days before her 21st birthday she underwent surgery. Since that time, Alyson has called the car accident a “blessing in disguise.” Doctors have told her she likely would have experienced seizures within a few years if the tumor had not been caught so early. Alyson recovered from surgery, finished her undergraduate education, and started her career. While working in the channel and earning her MBA, a routine follow-up exam in 2012 showed that the tumor had returned. Alyson had her second brain surgery a few weeks later at Roswell Park Comprehensive Cancer Center in Buffalo, NY. After her craniotomies, it was eye opening for Alyson to talk to others about her experience. She found that many people knew someone affected by a brain tumor or brain cancer, but it wasn’t spoken about publicly as much as other cancers. Alyson was grateful for the care she received and searched for a way to give back to Roswell Park. She learned that her neurosurgeon was involved in clinical research for SurVaxM, a vaccine that combats brain cancer cells and is used to help treat cancer. In 2013, with support from family and friends, she formed Buffalo Goes Gray to raise awareness and funds for brain tumor research. The charity is named for her hometown of Buffalo, NY and the color that represents brain tumors and brain cancer awareness. With a mission to bring greater attention to brain tumors and support continued brain cancer research at Roswell Park, Buffalo Goes Gray has raised more than $100,000. Each year the organization holds a major fundraising event in or around May, which is brain tumor and brain cancer awareness month. This year, the charity’s fifth annual event will be held on June 8th in Buffalo. Alyson has found synergy in her dual roles as channel executive and nonprofit organizer. Her professional experience and marketing skills have enabled the charity to better leverage the digital world. Equally, she says running a charity has allowed her to gain greater insight into all facets of business operations. Under Alyson’s guidance, every year Buffalo Goes Gray continues to grow. People are emotionally invested in the cause and in seeing how the research is making a difference. The clinical research trials for the vaccine are progressing and it has already shown the ability to extend the lives of brain tumor patients, based on updates by Roswell Park’s Dr. Robert Fenstermaker and Dr. Michael Ciesielski. So how can more people support Buffalo Goes Gray? Attend Events: Tickets are still available for the June 8 event in Buffalo, which includes food, drinks, raffles with donated items, a photo booth and more. Donate/Sponsor: Donate raffle or auction items, sponsor an event, or give directly online. Spread the Word: Follow Buffalo Goes Gray on Facebook, Instagram and Twitter. 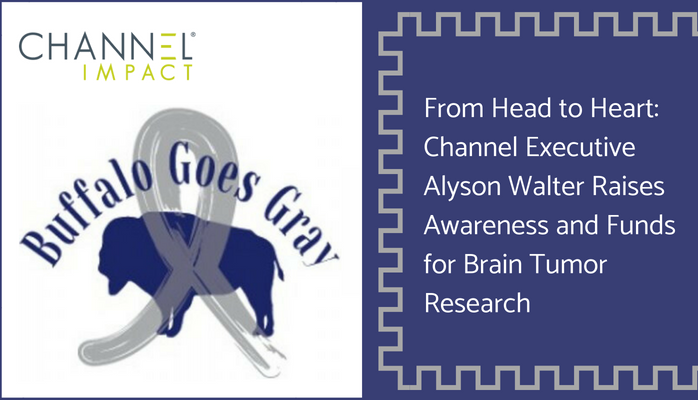 As Buffalo Goes Gray continues to raise money and awareness in Buffalo and beyond, Alyson will keep sharing her story. We’re proud to do our part in telling you about her incredible work and we hope you’ll join us in supporting her and the Buffalo Goes Gray mission.